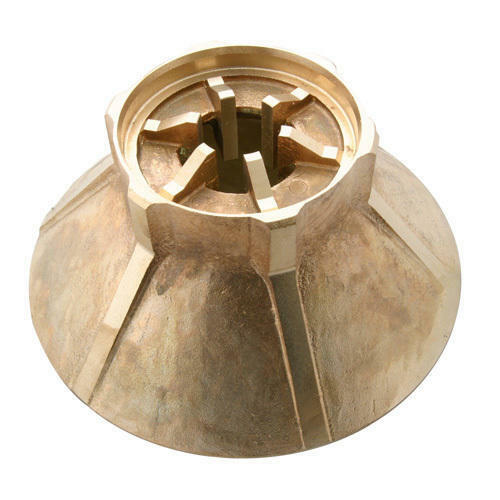 Manufacturer of a wide range of products which include copper investment casting. Bronze and copper investment castings benefit from high fatigue & corrosion resistance, strength similar to steel, and high ductility. Their high machinability and versatile mechanical properties allow for endless design flexibility. All bronze alloy types, including silicon and aluminum bronze, have the unique property of expanding during the casting process, completely filling the mold and eliminating voids and surface defects. Silicon and aluminum bronze are self-lubricating when subjected to pressure and friciton. Copper retains up to 95% of electrical conductivity, providing an optimal solution for electrical transmission applications. Bronze, silicone bronze, and aluminum bronze castings have traditionally been associated with art, but are quickly making the transition to industrial applications. Due to bronze's self lubricating properties, it is commonly used for high-speed ing parts such as bearings, sleeving, fans, and turbines. Looking for “Copper Investment Casting”?